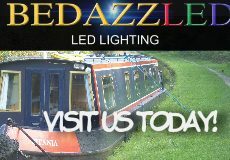 Bedazzled is a specialist company dealing in all aspects of LED lighting for the home, business, retail and leisure markets. Their roots, however, are firmly in the marine market – especially the inland waterways, where they have gained personal experience from 30 years of hiring and living aboard narrow boats. Products are available to order through their website.